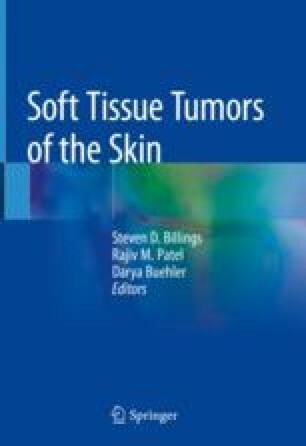 This chapter covers a large number of benign entities grouped together for convenience under the broad categories of fibrous, fibrohistiocytic, and myofibroblastic lesions. Fibrous lesions generally demonstrate a conspicuous increase in collagen production and varying numbers of fibroblastic spindle cells. “Fibrohistiocytic,” a somewhat enigmatic term, is a general descriptor for tumors containing a combination of spindle cells of putative fibroblastic, myofibroblastic, and/or primitive mesenchymal cell origin and histiocytes (bone marrow-derived tissue macrophages and dendritic cells). Myofibroblastic lesions are composed of spindle cells with combined features of smooth muscle cells and fibroblasts.